This colorful and nutritious Massaged Kale Salad is loaded with raw veggies, chickpeas and a Chili Vegan Ranch Dressing. 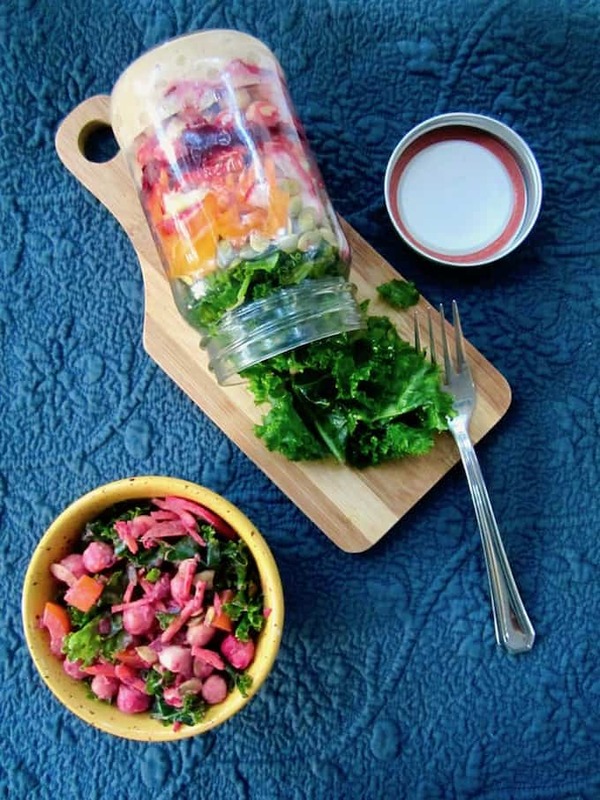 Mason jar containers are a convenient, grab-and-go option for an easy make ahead lunch recipe! Hover over this image to shop the jars I used in this recipe! First, I want to start by saying that I’m sending lots of love and prayers to all those in the US and the Caribbean affected by Hurricanes Harvey and Irma. Here in the Carolinas we’re counting our blessings for minimal impact and damage compared to other places. Please consider making a donation to the charity of your choice to support relief efforts – even just a few dollars per person all adds up to make a big difference! Today, I’m bringing you a make ahead lunch idea: Massaged Kale Salad with a Chili Vegan Ranch Dressing! Yum, right?! As a kid, I Loooooooooooved Ranch dressing! (Yes, that’s Love with a Capital L.) Chicken nuggets? Side of Ranch. Fries? Side of Ranch. Onion rings? Side of Ranch. Yea, I ate healthy as a kid… okay, sometimes I’d eat a salad, but only if it was drenched in – you guessed it – Ranch! The vegan Ranch Dressing I’m bringing you today is from The Rawtarian (so yes, it’s raw too!). I love her recipe so much that I didn’t want to change it, but I did add some chili powder to give this sauce some flavorful fall flair. (It’s not spicy at all; it has a mild chili powder flavor.) If you want more traditional Ranch dressing, omit the chili powder. If the words ‘massaged kale salad’ don’t make you think ‘yum’, then it’s time to up your palette missy (or mister). I know – not everyone is a kale lover (and the Ranch-loving child in me certainly wasn’t!) – but I definitely am now. While kale is available year round, it peaks in the fall so this is the best time of year to get fresh, vibrant kale! 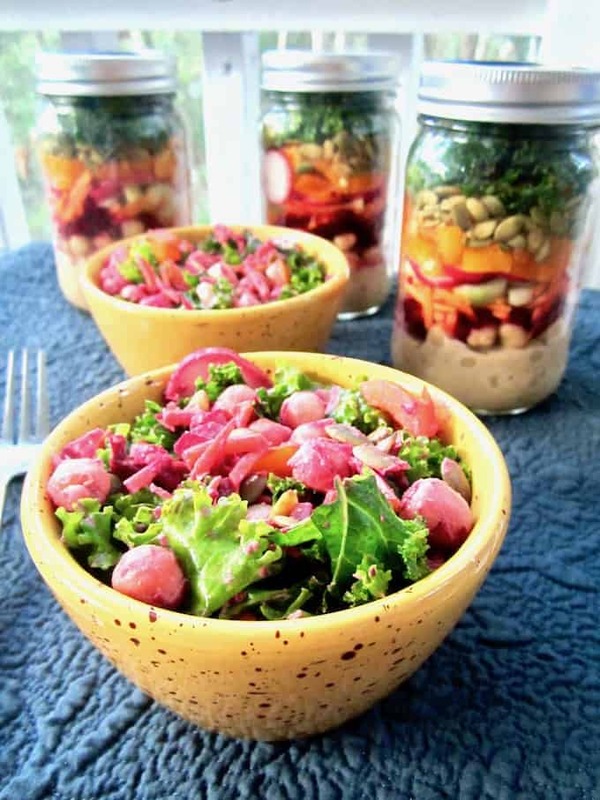 Mason jar salads have been popping up all over blogs for a couple years. They’re awesome because you make everything in advance and then just layer the ingredients in a jar for convenient, portable eating later. ASSEMBLY: Start with the dressing on the bottom so it doesn’t make everything soggy, and then layer in heartier foods like beans, lentils, heavier grains (like rice or pasta), carrots, beets, celery and peppers. The next layer is composed of more delicate veggies and fruits like cucumbers, tomatoes, berries and avocado. Next goes any nuts, seeds and lighter grains (like quinoa or millet) and then finally, the salad greens on top. I bought these jars online at SKS Bottle & Packaging, an industry leader suppling over 6,000 options for glass, plastic and metal bottles and jars – perfect for canning season! Their glass jars are 100% recyclable and made in the USA. If you have extra berries and tomatoes for the summer, make jam or tomato sauce and store them in mason jars. This fall, you can make apple sauce, pumpkin butter and all kinds of goodies in the slow cooker and then store in mason jars. And, of course, they make great storage containers for leftovers, sauces/dressings, soups and packed lunches! 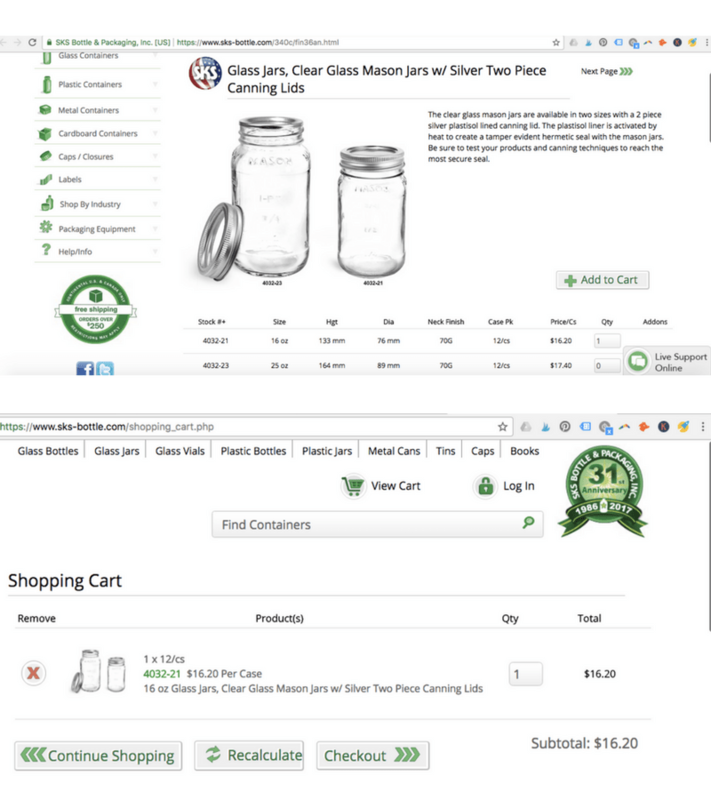 The SKS Clear Glass Mason Jars are available in two sizes with a 2 piece silver plastisol lined canning lid. The plastisol liner is activated by heat to create a tamper evident hermetic seal with the mason jars, so if you’re using these jars to can and store, this is a great feature! Of course, be sure to test your products and canning techniques to reach the most secure seal. Here’s a screenshot of how to order – easy peasy, just add to your cart and then you can pay via PayPal in the checkout, which I love as I feel like my information is more secure. Raw kale has a tough, cruciferous exterior and is typically bitter. By massaging raw kale with lemon juice or olive oil, it literally breaks down the fibers and makes the kale more tender and sweet, plus much more easily digestible to your body. Unlike other more delicate leafy greens which tend to wilt and become soggy after chopping or physically “breaking” down, kale will keep it’s soft but chewy texture without becoming mushy or too soft. If you’re looking for some make ahead lunch ideas or want to can some fruits/veggies this season, be sure to check out these SKS Clear Glass Mason Jars at SKS-Bottle.com for convenient storage options! 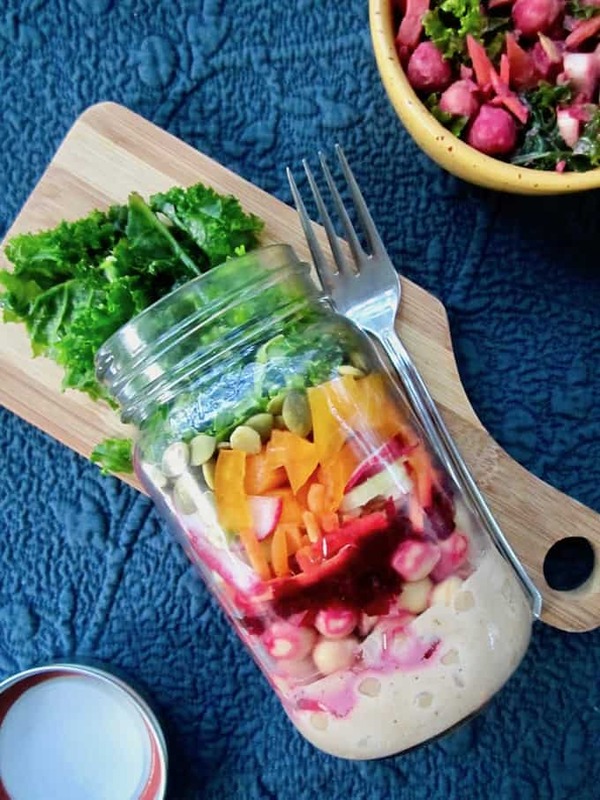 Have you hopped on the mason jar salad train? What do you love to put in your make-ahead salads? Let me know in the comments below! This colorful and nutritious salad is loaded with raw veggies, chickpeas and a delicious vegan dressing. 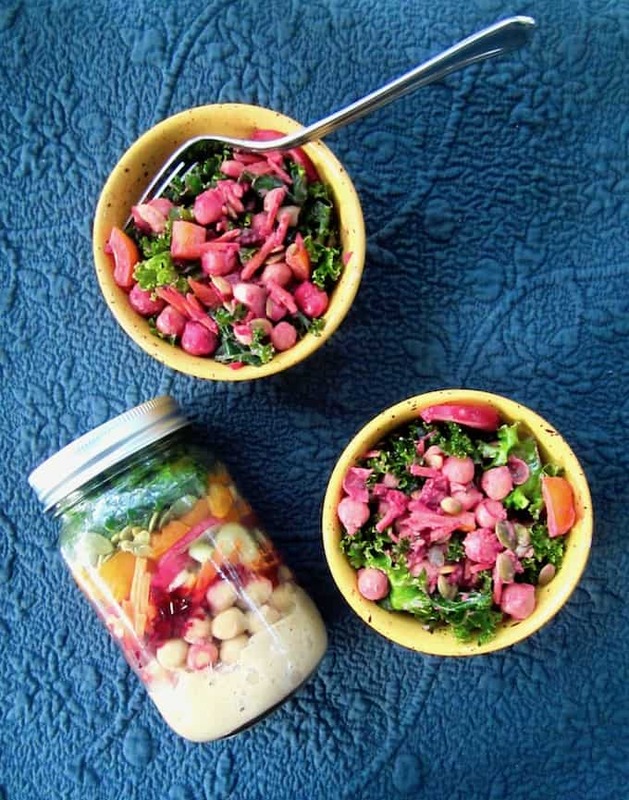 Mason jars containers are a convenient, grab-and-go option for an easy make ahead lunch recipe! NOTE - when I assembled my salads later, I enjoyed adding arugula, freshly sliced avocado, corn and extra dressing. You can of course put these ingredients in the jar too - how you compose these is up to you! (If you add other lettuces besides kale, don't massage those, just put them on top). In a large bowl, combine the kale, olive oil, lemon juice and sea salt. Massage the kale with your hands for a few minutes. You'll notice the kale leaves will become softer and turn a darker green. In a high speed blender, combine all ingredients for the Chili Ranch Dressing. Blend until smooth. *Time allowing, soak your cashews submerged in water in a bowl on the counter for at least 30 minutes. Drain the water, then add cashews to the blender. This helps the nuts digest easier in your body. ***To make this meal completely raw, omit the chickpeas. Awesome Allison, yay! Hope you love it! Love easy to go lunch ideas! That dressing sounds delicious! I love anything chili. I think i'm going to have to try a few of these for the week! Loving salads and it's great to be able to take it on the go! Awesome Anjali! Hope you love 'em! Mason jar salads are the best! I love all of the healthy veggies in these. I need to make a few for lunch this week. So cute! Everything is more fun in a jar! 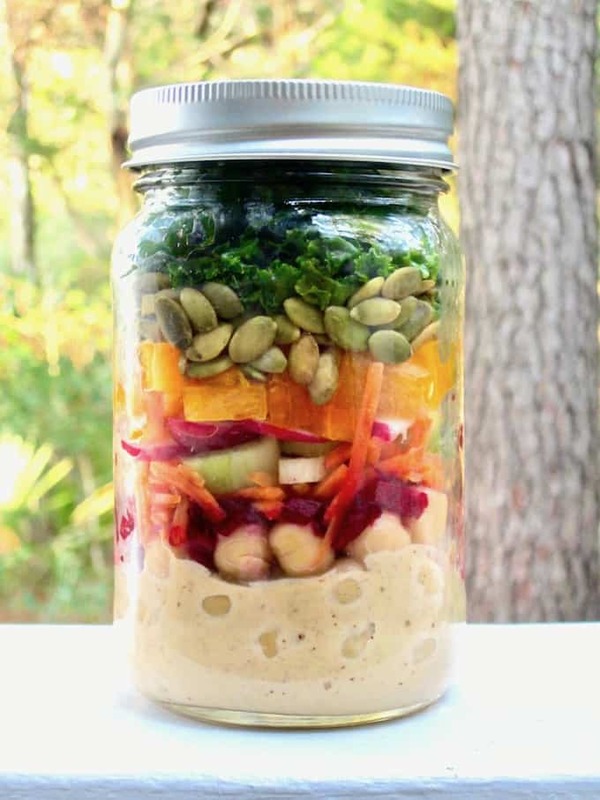 I love meals in a jar, and this sounds like my kind of on the go meal. Thanks for sharing!